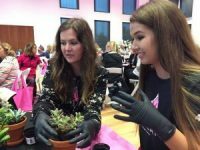 The Placer Breast Cancer Foundation holds several events each year to raise awareness about breast cancer, offer educational opportunities to our community, and raise funds for our education and research donations. In addition, we are honored to have several outside organizations raise funds for us through events that they hold, as well as allow us the opportunity to raise awareness in our community. If you would be interested in attending an event, please click on the link below. If you would like to be added to our newsletter so you can hear about upcoming events and read more information about breast cancer research and education, please fill out the form on the right of the screen. In addition, Board members and volunteers are honored to speak and participate in local breast cancer outreach opportunities, including regional high schools and community organizations. If you would like to host a fundraiser or would like a Foundation member to speak at an event please email us at info@wethinkpink.org! We would love to talk to you! Our 4th Annual Placer Women’s Retreat will be held in May of 2019. Join local women as we learn more about work-life balance, hear nutrition and exercise tips, and spend time with family and friends (and do a little shopping too). We will be holding our 12th Annual Hot Pink 5K in the fall of 2019. Look out for some new changes coming this year! Join us on December 8th for our 5th Annual Orange is the New Pink 5K Walk for Breast Cancer! Enjoy a walk through the beautiful mandarin orchards in Penryn, mimosas and pancakes, and vendor booths. This is a great, family friendly event! Coffee Break & Learn – coming soon! Starting in May, 2019 we will be working with our health partners to offer quarterly learning sessions to learn more about new developments in breast cancer research, prevention and care! These talks will also allow you an opportunity to learn more about the studies and research that are funded by your donor dollars.